October 9, 2004 marked the 400th anniversary of the first sighting of the supernova of 1604 AD, now known colloquially as Kepler's supernova. On this page I provide some general information and links about both the historical and scientific aspects of Kepler's supernova and expanding supernova remnant that we see today. NASA press release about this result. JHU press release about this result. Spitzer News site on this result. Hubble News site on this result. Chandra News site on this result. Hopkins Gazette Article, Oct. 11, 2004 issue. We are indeed talking about Johannes Kepler, the famous astronomer and mathematician who was a contemporary of Tycho Brahe and Galileo Galilei. Kepler is most remembered for his three laws of planetary motion, which were derived in no small part by using the observational data amassed by Tycho Brahe. In 1604, Kepler was the court astronomer for emperor Rudolph II in Prague. 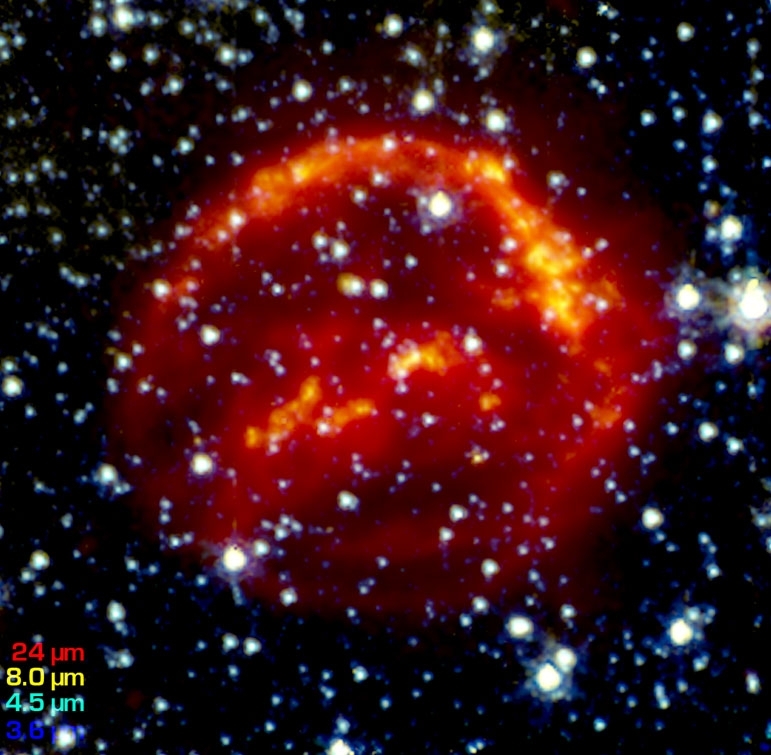 Why is it called "Kepler's" supernova (and supernova remnant)? Most people assume that because the supernova of 1604 was named after Kepler, that he must have been the first to see it. WRONG! Historical reports indicate that the supernova was first seen by observers in northern Italy on the evening of October 9, 1604, and far eastern (Chinese and Korean) within days thereafter. In Prague, an independent sighting was made on October 10th through a break in the clouds, by J. Brunowski, described as a meteorologist (the local weatherman! ), who reported the sighting to Kepler. (This apparently led to the long-standing tradition of having the local weatherman report "science" stories on TV stations across the country...) Cloudy weather in Prague prevented Kepler from observing the object until the evening of October 17th. Of course, there was no internet or e-mail, so none of these observers knew anything about what anyone else was doing! Kepler's claim to fame (as far as the supernova is concerned) comes from the fact that he recorded observations of it over the course of a year, and that in 1606 he published a book about it. 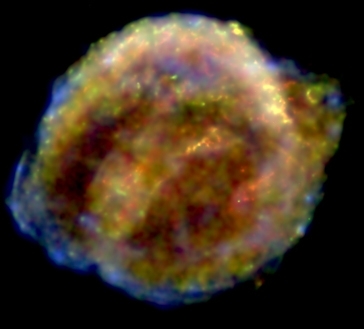 In the mid-1900's, when astronomers first reported the faint emissions from the expanding remains of the exploded star, these leftovers became known as Kepler's supernova remnant (a.k.a. G4.5+6.7 in radio catalogs). CLICK HERE for a link to some images of Kepler's 1606 book, De Stella Nova (The New Star). I have recently written an overview paper on Kepler's supernova remnant for the international conference 1604-2004: Supernovae as Cosmological Lighthouses, held in Padua Italy in June 2004. This presentation is available in PDF file format HERE. Caption: Four views of Kepler's SNR. (Left to Right) Chandra X-ray Observatory, Spitzer Space Telescope (IR), Hubble Space Telescope (optical, enlarged), and the Very Large Array radio telescope view. Click on any image to see a larger version. 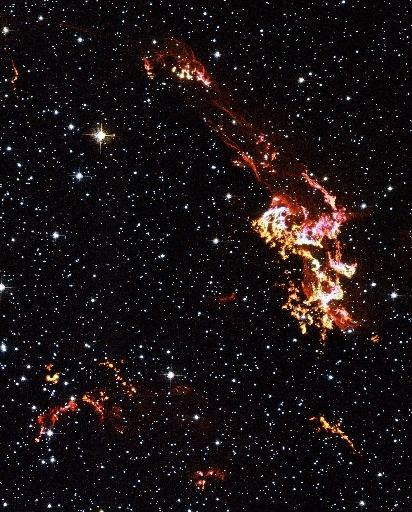 Supernova remnants are inherently multiwavelength objects. The supernova blast wave moves outward at thousands of miles per second, sweeping up surrounding material into a glowing shell of gas and dust. The gas and dust are heated by the blast wave, but subsequently cool back down, emitting the whole gambit of electromagnetic radiation, from radio waves through X-rays. 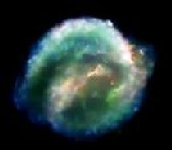 The full power of multiwavelength observations have recently been brought to bear on the remnant of Kepler's supernova. My colleagues and I have combined data from NASA's three operating Great Observatories to get a much better picture of the overall structure of the remnant and better understand the interaction of the supernova blast wave with the surrounding medium. (Image at left.) The Hubble Space Telescope has provided optical images with exquisite spatial resolution that show the details of the shock interactions. These observations have been highlighted in the October 2004 release of the Hubble Heritage Project. The Chandra X-ray Observatory images show two kinds of hot gas; one component is interstellar gas that has been swept up and heated, and the other is due to `ejecta,' material from the star that exploded, that has been heated to 2 million degrees. The Spitzer Space Telescope data show a completely different component, shock-heated interstellar dust. Interestingly, the Spitzer observations do not show any clear indications of dust in the ejecta regions, but rather are dominated by dust in the main blast wave-interstellar medium interaction regions. 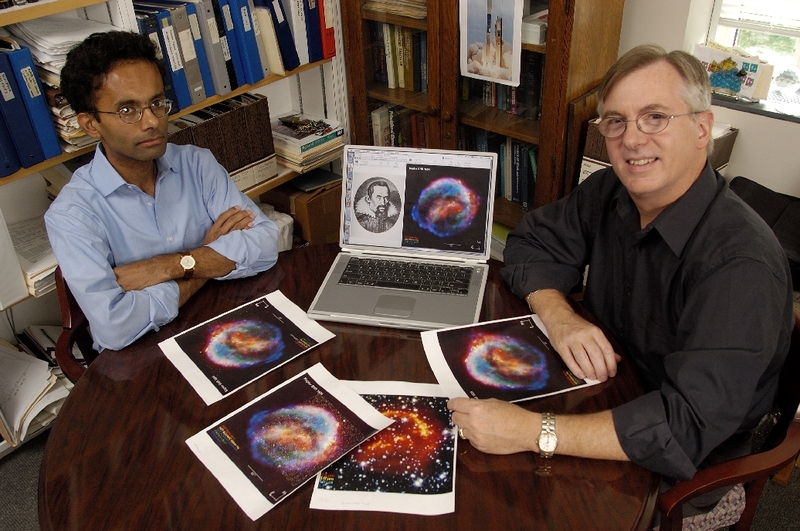 Caption: Ravi Sankrit (left) and Bill Blair (right) inspect images of Kepler's supernova remnant in Bill's office at JHU. (Photo by Will Kirk, JHU.) Click on image to see a larger version. Many of these aspects of the supernova remnant can be inferred from the individual data sets, but seeing them combined shows the relationships between the different emitting components in a much different way. For example, the infrared (Spitzer) image is brightest at and surrounding the regions that are seen by Hubble. This means the heated dust comes from the same component seen by Hubble, which is shocked circumstellar and interstellar material. ("Circumstellar" just means material that was surrounding the star, and likely shed from the star, before it exploded. It didn't have to be that way. We thought the Spitzer observations might be brightest in the interior X-ray regions, where dust might have formed from the ejected stellar material, but that's not what we see. The combined image is really an example of the total being greater than the sum of the parts!